Attorney Yomtov Kalfon, French Oleh who served as a lone soldier and immigrant activist, joins New Right party. 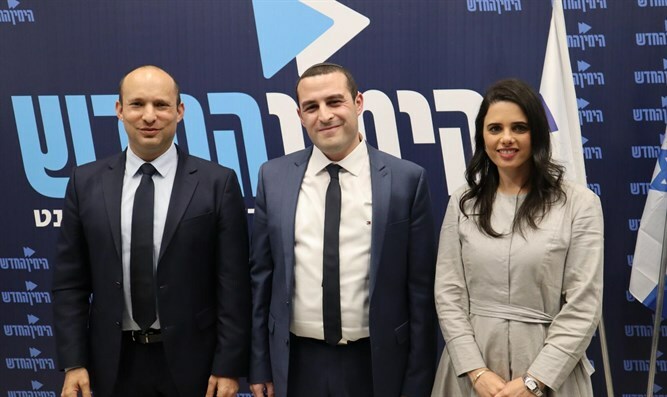 Ministers Naftali Bennett and Ayelet Shaked, leaders of the New Right party, announced Tuesday at a festive press conference that a national program was being launched to bring 50,000 French and Belgian Jews to Israel. At the same time, the two announced the addition of a French-born candidate to the New Right's Knesset list, attorney Yomtov Kalfon, chairman of the Alenu Movement for the Advancement and Integration of Immigrants in Politics, a former delegate to the World Zionist Congress and an Israel advocacy activist in French who immigrated to Israel to serve in the IDF. Kalfon, 32, was born in the suburb of Sarcelles in the outskirts of Paris and immigrated to Israel at the age of 18 alone to enlist in the IDF as a lone soldier, where he served in the Netzach Yehuda battalion. During the Second Intifada Kalfon was active in the Bnei Akiva youth movement and Betar in Paris. He participated in demonstrations in support of the State of Israel, against biased media coverage of Israel and its activities and various protests against manifestations of anti-Semitism in the country. In 2016, Kalfon founded the Aleinu organization, which he headed until joining the New Right, to promote immigrants in national and local politics in Israel, in order to represent immigrants faithfully in the public sphere. Education Minister and new right-wing chair Naftali Bennett said, "Today we are making a giant step toward a historic move. After years of missing out on the wonderful immigration of French Jews, we will embrace them close. Yomtov Kalfon has a true Zionist soul and will be the voice of the Jews of France in the Israeli Knesset. Calfoun joins the New Right list today to strengthen the field of immigration and move his extensive social work forward. Alongside his joining us, we are launching today a national program to bring 50,000 Jews from France and Belgium, a wonderful Zionist immigration that over the last few years the Israeli governments missed the historic opportunity to bring. It is our moral obligation to raise the gauntlet and help them, and so we will." Justice Minister and New Right-wing chairwoman Ayelet Shaked added, "Yomtov Kalfon is a contemporary Zionist pioneer. A person who immigrated alone from France to the State of Israel at the age of 18 only out of love for the land and a deep identification with Zionism, and will represent the immigrants of France in the Knesset. The New Right is a political, economic, legal and security right, as well as a right that encourages [aliyah] and cares for those who have already immigrated to Israel. Now the new right is also home to immigrants from France."